Did you see The Big Short yet? A movie based on Michael Lewis’ hit book of the same name, The Big Short was released in late 2015. It’s the story of how a small, clever group of people saw the 2008 mortgage crisis coming. Initially, these people and their warnings were mocked. Eventually, they were vindicated… and made billions of dollars by betting correctly on the outcome. People loved The Big Short. It was nominated for five Academy Awards, including Best Picture. Critics praised the movie for explaining complicated financial concepts in such a way that layman moviegoers could understand them. If you haven’t seen the movie, it’s worth watching. It’s both educational and entertaining. But as good as The Big Short is, it failed to teach the story’s greatest, most useful lesson. It failed to share one of the world’s most powerful financial strategies. I’d guess maybe one investor in a 1,000 knows this strategy… and less than one in 100,000 knows how to use it properly. But it’s how the traders who inspired The Big Short turned relatively small amounts of money into millions – even billions – of dollars during the housing collapse. They made returns in excess of 10,000% (a gain that turns $10,000 into more than $1 million). One trader, John Paulson, used this strategy to make over $10 billion for himself and his clients, one of the biggest scores in market history. As powerful as this strategy is, you almost never see it discussed in the mainstream press. You almost never see it mentioned on financial television. But those who understand its power use it to generate incredible wealth. In this letter, I’ll explain how it works… and how you can use it for your personal benefit. You probably learned about symmetry in school. It’s when the parts of something have equal form and size. 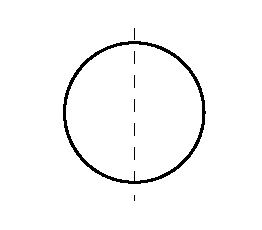 For example, cut a circle in half, and the two parts are symmetrical. In many cases, symmetry is attractive. Generally speaking, the more symmetrical someone’s face is, the more attractive they are considered to be. Symmetry can be attractive in architecture, art, and landscaping. But when it comes to the financial markets, expert operators avoid symmetry. Expert investors and speculators hunt for asymmetry. An asymmetric bet, trade, or investment is when the potential upside of a position is much greater than its potential downside. If you risk $1,000 for the chance of making $10,000, you make an asymmetrical bet. 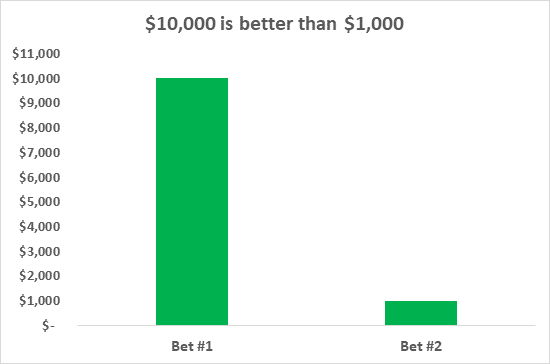 If you risk $1,000 for the chance of making $1,000, you make a symmetrical bet. Which one is more attractive to you? You’re probably thinking the chance to make $10,000 is better than the chance to make $1,000. That’s good. That’s the right answer. Even though this idea is simple common sense, most people fall into the trap of making symmetrical bets in the stock market. Many investors commonly risk 100% of their money in the pursuit of a 100% return. Or even worse, they risk 100% of their money in the pursuit of a 50% return. For example, an investor will buy a stock that some expert touts as having “100% upside,” and he’ll be willing to ride the stock to zero (a 100% loss) if things don’t work out. This kind of symmetry offers you horrible odds… the odds you’ll find in casinos and most sports betting. Most people don’t understand this concept, and it kills them in the financial markets. Again, symmetry is for chumps. I won’t touch an investment with a symmetrical risk/reward profile. When I put my money to work, I look for opportunities where I can risk $1 in the pursuit of $20 or even $100 in returns. Risk a little. Make a lot. That’s the idea behind asymmetric bets. As I mentioned, the guy who risks 100% of his capital to make a 100% return is making a bad, symmetric bet. So who is making asymmetric bets? And how do you find those bets? If you buy a stock with 500% upside potential and you’re prepared to cut your losses at 50% of your investment, that’s an asymmetric bet. Stocks with the potential to massively appreciate in value offer asymmetric risk/reward profiles. This is a big reason I devote my time and energy to natural resource investing. This volatility gives life to many 500%+ stock market winners every year. The key is to buy assets after busts and before booms, not the other way around. As I’ve written before, most investors think “volatility” is bad word. You don’t want to see it in your prudent, conservative investment mix. The talking heads on financial television bemoan volatility. Mainstream headlines make it sound like a terrible thing. As s a professional investor, I love volatility. I owe much of my success to this “dirty word” of the financial world. I believe it’s a landmark moment in an investor’s career when he or she realizes that volatility can be harnessed, directed, and used like a tool to create wealth quickly. If you know how to harness volatility, the natural resource sector can be a constant source of high-quality, asymmetric bets that build wealth for you. You can make returns in 10 months that take most people 10 years to make. If you focus on making the kinds of asymmetric bets that are common in the resource market, I can’t guarantee you’ll make billions like the guys who inspired The Big Short. But I can guarantee you will dramatically improve your investment results.